Mix the first seven ingredients together in a large bowl. 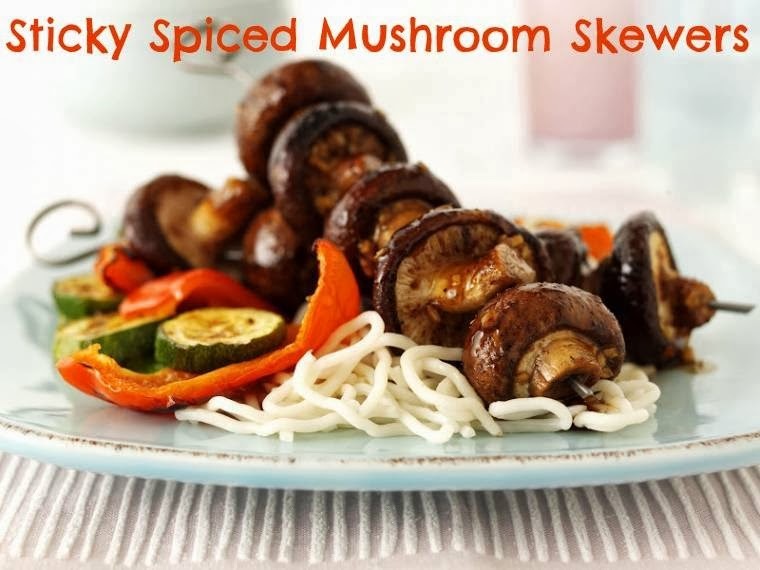 Add the mushrooms and stir well until they are coated in the marinade. Cover and leave to marinate in a cool place for at least 1 hour. Drain the marinade into a small pan and simmer for 1-2 mins until syrupy. Thread the mushrooms onto skewers then cook over hot barbecue coals or griddle or under a hot grill for about 10 mins, turning frequently and brushing with more of the marinade. Serve hot with noodles and char grilled peppers and courgettes. "Pineapple Yogurt Meringue Creative Mondays Blog Hop …"
"Chocolate Chip And Cherry Bread Pudding …"
Yummy! And we are not allergic to any of it! yay! now I know what's for dinner.